BarCampLondon – wow, what a rush. Wow, what can I say… It’s 24 hrs since BarCampLondon finished and I’m still recovering! It went even better than I expected, with no real dramas, problems or hiccups. 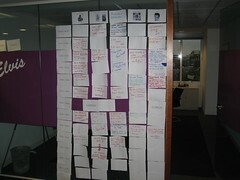 But what’s more, I really enjoyed organising it too. From what I have read on the blogosphere, most people found the unconference format to be enjoyable and rewarding once they got into it. This was of course the first BarCamp (and probably unconference) to take place in London and so for many it was something of an unknown. A lot of people had been concerend about having to present in front of an audience but once they realised it took place in small groups around a table most people were very comfortable with the format. After all, it was not much different to having a chat around the pup table, albeit minus the pints. But I was more than happy to do this and I did get to catch some interesting discussions ranging from future web app architypes (by Matt Webb) through to creating a near-realtime train map (by Matthew Sommerville). What was particuarlly pleasing was the cross-section of attendees – from uber techies through to usability specialists, designers, marketing people and even those not formally working in the IT industry. With that came an equally wide range of presentation subjects – from tech-focused introductions to XSL/T and Microformats through to better user-centred design and even MP3 DJing. I think most people agreed that we should have more unconference events like this in London. I certainly would like to see another BarCampLondon – maybe as soon as 6 months time or so. However I would like to see some more specific events. PodNVlogCamp – If anyone remembers PodCastConUK last year, it’s time we had another such event and why not make it unconference? Thanks to all that came, and I’m sorry to those who were unable to get onto the attendee list. We tried our best to enable as many people to come as possible, but ultimately we were never going to be able to accommodate – and never will, I don’t think either. I liked the idea of accepting signups from everyone and radomly picking 100 attendees for the next BarCamp. This avoids the challenge of not missing those who don’t find out about the event within hours of it’s announcement, etc. Well, whatever happens I hope to see you all at the next event! 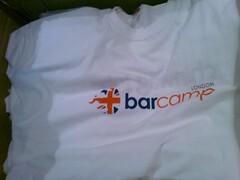 I’m really hoping by us doing the first british BarCamp, we will spark others to setup specific camps. There’s no douht that it will be a lot easier to convince people and companies that this format for a conference can and will work. Its certainly empowering, I just hope things turn out well for those getting involved in setting up camps. Either way, I’ll be involved in one of the *camps soon. No seriously. The Barcamp was flawless, and a lot of thanks to you and Ian and the guys at Yahoo organizing it. There are rooms for improvement as always. but it was really a great event and I would have kicked myself if I had missed it. You ideas sound fun and given the broad range of topics that should be cool too. As far as I know the Podcastcon UK is in planning, but it is interesting – when reading your comment i immediately thought this is not lending itself to an unconference. But I will ping the organizers to it. Mobilecamp sounds great too. Totally brilliant! I wasn’t at all sure about the event, and only agreed to go once Tantek Celik talked me into it, but I’m so glad I did. I’d definitely go to another *Camp. Ben I would also just like to say, good luck with your move to America. I know you will do well out there, just remember not to come back asking for bloggers to be good natured to each other because if you do, we will all shout bullsh*t.
But honestly its been a pleasure and honor knowing you and working with you. Your speech about risk made a lot of sense and I respect what your doing out there. I’d also like to see an event, probably much more social than unconference, that brings together everyone from ubergeeks through people the HCI and accessibility folk out to just people who have neat ideas but no technical knowledge. Perhaps that’s too vague, though. Haven’t you gone yet Metcalfe? If anyone is interested I’m organising a MediaCamp in BUCKS (30 mins west of London) Oct 20. Congratulations! Antiki is now quite near the web site at which the Anglo Saxon “Jolly Boat” bearing the barely surviving Tapscott and Widdicombe arrived ashore so extended in the past. Unfortunately the weather is unusually poor for this time of 12 months, visibility is poor and also the onshore wind quite strong. Possibly, as dusk falls, you happen to be in a position to discern one thing of this amazing island in the driving rain and spray. Even so, dangerous and likely invisible reefs separate you in the beaches stretching south from James Position. The choice to push on to Harbour Island is really a wise one; we appear forward to greeting you up there. Possess a safe onward journey!